In a world of bleak, miserable and far-too-gritty-for-their-own-good games, I’ve always been able to count on the lovable, fluffy pink ball of…something to provide a bit of imaginative whimsy and playful joyousness to world of grey and brown. He’s a rather malleable and versatile sort, Kirby. In the past, he’s been a pinball, a bit of twine and very probably many other things, but here, in his freshman Wii U outing, he’s a blob of Plasticine, a construct of modelling clay. Everything is. There’s no real reason why everything is, but it is. And it looks fantastic. Every character, model, pathway, enemy and everything else seems to be moulded from clay, sporting irregularities, malformed bits and the rough, bumpy edges you’d find in hand-moulded modelling clay. I do wish it had more of an effect on the game or its systems, instead of being a mostly aesthetic contrivance, but it certainly does add a unique look and feel; a vibrant clay-mation world of wonder. Kirby games are always so filled with colour. Only that’s the problem this time. The colour’s gone. No, not from the game itself, which is still as joyful and borderline saccharine as every other Kirby game. 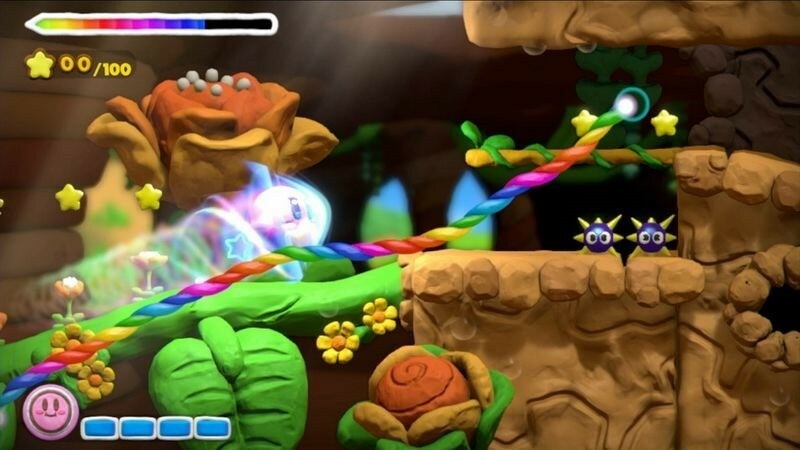 Dreamland’s colour’s been stolen, and yes it’s up to Kirby, along with his new pal – a magical rainbow paintbrush named Elline – to restore colour to the world. Kirby games are not known for their narrative chops. They tend to make up for that with great gameplay, and that’s exactly what you’ll find here. 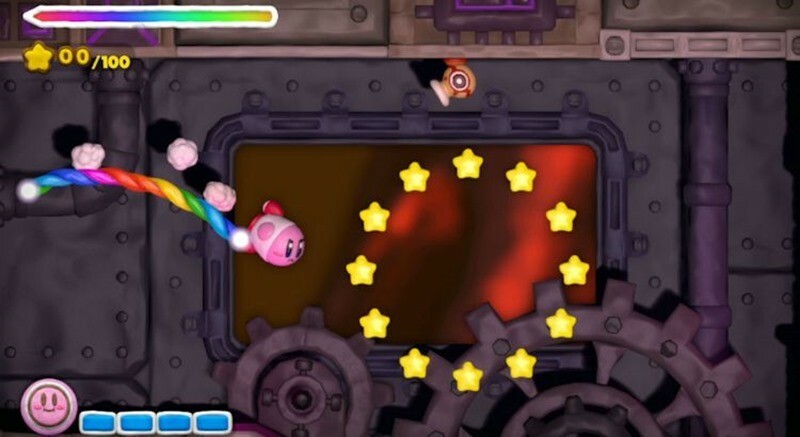 Taking more than a page from the handheld excursion, Kirby and the Canvas Curse, Kirby and the Rainbow Paintbrush as it’s known in European territories has you drawing lines for the pink ball to travel on. For whatever reason, our hero’s lost autonomy, and is only able to traverse lines that you draw for him on screen. If you’ve never played Canvas curse, this sort of indirect control may take some getting used to. You’ll use the stylus to scrawl paths for him to go, tap him to give him a burst of speed that’ll hurt enemies. 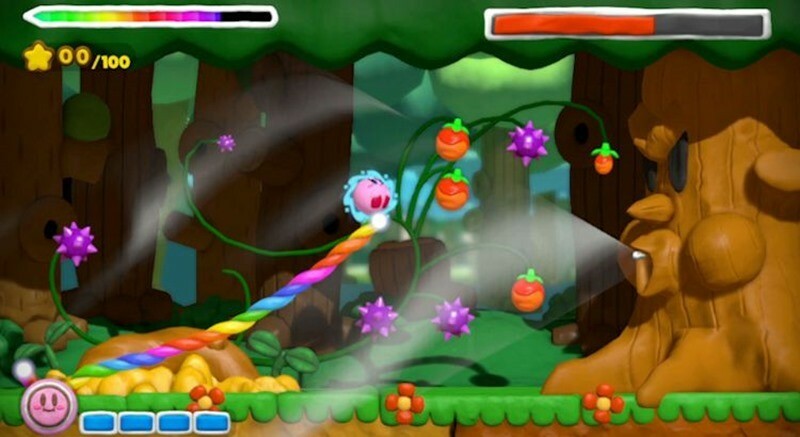 You’ll draw lines on the Gamepad with the aim of catching him, indirectly steering him along on the rainbow rope he clings to, and occasionally blocking his path to change his direction. It’s remarkably, deceivingly simple. 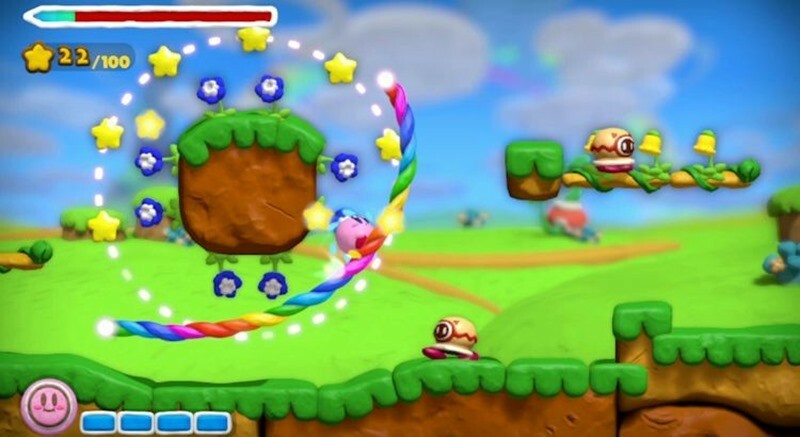 Kirby’s lost his copy ability this time, so the real meat of it all is really just moving Kirby using a bit of magical rainbow rope. You’d imagine it gets quite tiresome, but the game’s designers have managed to keep the game entertaining throughout. It’s all down to impeccably clever level design, all of it intricately built to get the most out of its central conceit – with clever twists on the idea thrown in to keep you frantically scribbling all over the gamepad. 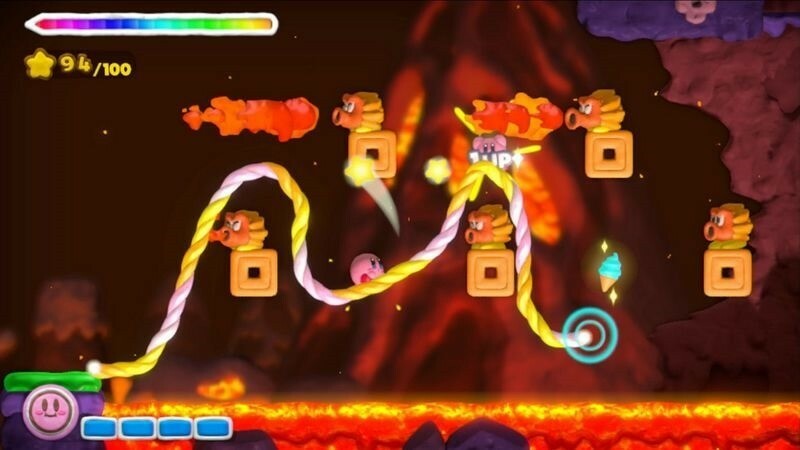 Sometimes you’ll split Kirby in two, guide missiles with your scrawl or use the magical rope to connect pathways. Similar to his transformations in the fabric-tastic Kirby’s Epic Yarn, the gluttonous, glutinous blob will be transformed into some sort of vehicle; a tank that moves of its own accord and registers screen-taps as commands to fire missiles; a submarine that automatically fires; a rocket that blasts forward and requires rope as a guidance system. It all adds to a game that never overstays its welcome despite being based around a single premise. As with games of this ilk, stars litter the landscape, as do other collectibles, treasures and hidden secrets. Collecting 100 stars allows Kirby to do a charged attack, useful for breaking down certain walls or dispensing with trickier enemies. Boss battles punctuate the ends of whole areas, and they’re clever, well designed encounters. It’s just a pity there are only three of them, with each boss recycled later on before a final showdown. There’s also a strange sort of co-operative play, where up to three friends can jump and play as perfectly able Waddle-Dee. They’ll use Wii remotes, and are able to carry Kirby, kill enemies and generally make life much easier for the pink fella. It’s also about the only time having a TV is necessary. Because you’ll be scribbling on the Gamepad, you’ll likely never really look at the TV, making this such an off-screen experience, that one wonders why it isn’t on the 3DS instead. Your eyes will be permanently affixed to the Gamepad’s smaller, washed out screen, and you’ll unfortunately miss much of the visual resplendence. The Amiibo integration is also a bust, with Kirby and related figurines adding little to the experience. Tapping Kirby or his friends to the GamePad essentially just gives you cheats; Kirby himself gives you unlimited charged bursts, King Dedede adds extra health, while Meta Knight adds a mask, and allows Kirby to dash faster, helping dispense with some of the weaker enemies easily. Each Amiibo power-up lasts for just one stage, and can only be used once a day, so it’s hardly game-breaking, but hardly worth having either. The game is a little on the short side, and will take you just a half dozen hours to plough through if that’s your idea of a good time. Finding all of the treasure chests – which unlock in-game models – will take decidedly longer, and the wealth of extraneous challenges that will put your stylus skills to the test add a dash of longevity to the game. Its short running time shouldn't dissuade you. With memorable, meaningful levels that cleverly utilise the game’s simple dynamic with aplomb, it’s wonderful, joyous stuff; cute, clever and charming. And unlike other Kirby games, it’s actually challenging.